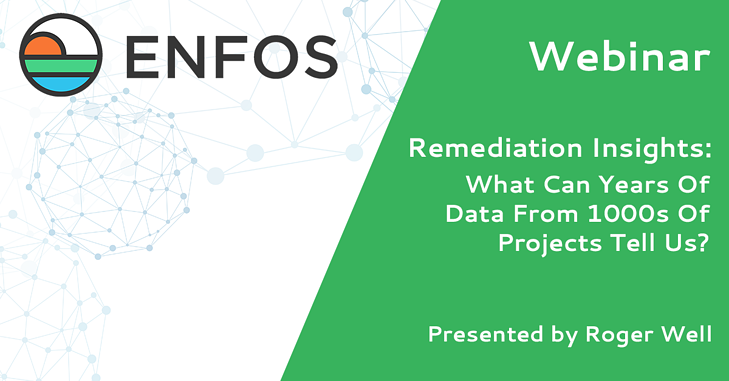 As an enterprise environmental liability management platform, ENFOS customers and users have access to both structured and unstructured data on all of their remediation projects. Many customers have been using ENFOS for 10 or more years and in many cases, migrated historical data collected years before that. The type of data collected includes site and project details, environmental data, and financial data associated with lifecycle and reserve forecasting, individual scopes of work in all phases, and actual costs. Customers view this data as a strategic asset to their organization. These large repositories of data can be analyzed using business intelligence solutions to answer some of the most compelling questions about past, current, and future performance and risks. · How well have we forecasted “estimates to complete” in the past and what does that mean about our current forecasts? · How can we select and predict sites that may need to be on our “watch list” for potential cost variances against the plan? · Based on concentrations of target analytes in groundwater how can we evaluate a portfolio of sites to determine those that may need more attention? Data-driven decision making and the use of business intelligence on large and complex data sets is a must for the modern day environmental professional. Enjoy this 1-hour exploration of these techniques and the technology behind them. Think your company could benefit from a management system tailor-made for remediation ? Book a 15-minute call with us and we'll help find out. Curious why we claim that traditional project management systems aren't enough for remediation? Find out why here.